A recent poll has concluded that this year’s “American Mother of the Year” is none other than Sarah Jane Moore, a San Francisco area resident. Moore was however unavailable for comment on this news, as she is presently in a California jail awaiting sentencing for her guilty plea in the attempted assassination of President Ford. 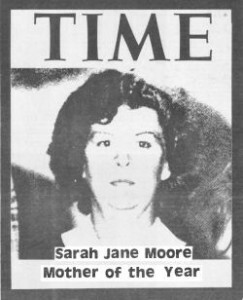 One of the qualities which Sarah Jane Moore exhibited in achieving this honor certainly had to be her personal struggle and subsequent rehabilitation, rising from a housewife to a nondescript FBI informant, and finally into a genuine, if politically naive, high-level assassin. The transition must have been fraught with difficulties, opening her eyes to see that she didn’t have to mull through life with tunnel vision and the usual paranoid symptoms of a government employee. Then there was of course the problem of obtaining a pistol without a permit, with the necessary accuracy and range. Instead of falling before such obstacles, Sarah Jane Moore proved that women from every age group and position in society can overcome the limitations of their roles and do something that makes a difference. We are sure that if she could respond to this tribute now, Sarah Jane would urge every woman, or man for that matter, to pick up where she left off. To take a shot at fulfilling our potentials…and to zero in on the desires and needs which we suppress daily.